A delightful website, by an admirable organization called Tuleyome, offers good articles about the early residents of our area. 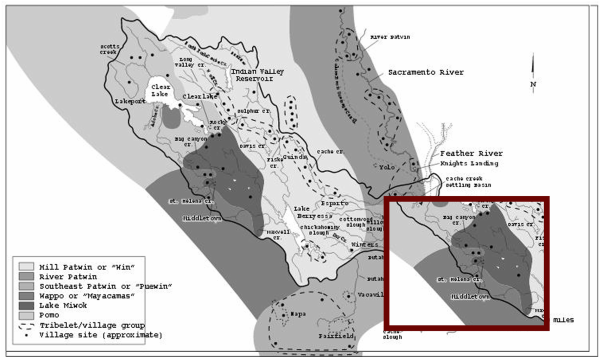 The earliest inhabitants of the Guenoc Valley area probably belonged to the tribes of the Lake Miwok. According to anthropologists writing near the turn of the century, this group of people lived in the area generally bounded by Lower Lake, Cobb Mountain, Middletown, Pope Valley, Mysterious Valley and Cache Creek. The village of Tuleyome, located on Copsey Creek about three miles south of Lower Lake, is thought to have been the ruling village for the Lake Miwok. The principal village in the southern area was Oleyomi ("coyote place"), in Coyote Valley, which lies just west of Guenoc Valley; the village stood along Putah Creek, on the ranch owned variously by former San Francisco Mayor James D. Phelan, Launcelot Gamble and Mary Bowcher and since then by the Comstock family. This tribe was called Koo-noo-la-ka-koi ("Coyote") according to Chief Augustine of the Hoo-la-nap-o tribe, at Lakeport. At one time one hundred people lived in Oleyomi, but when historian H. H. Bancroft visited, only twenty people remained. Small pox, kidnappings, killings, and other disasters for which western civilization was responsible had decimated their ranks. Map of the Indian populations around Clear Lake, published in the Tuleyome Tales, accompanying the article by Robert Thayer at the website address given above. In 1912 the government purchased the Middletown rancheria called Wilokyomi ("dusty place") and moved all local Native Americans there. 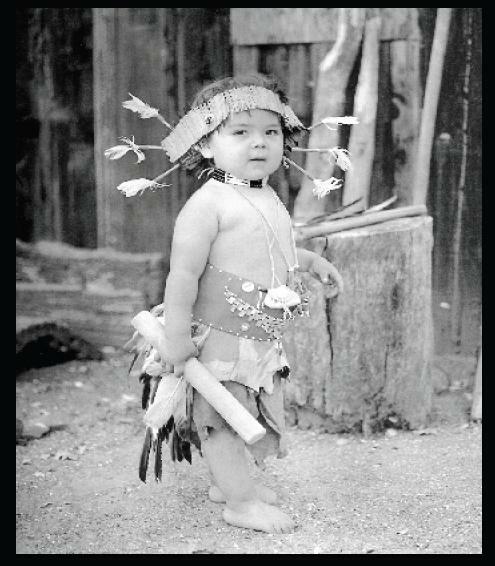 By 1925 the entire population of the Lake Miwok was estimated at 500 members. Prior to the move, the village of Oleyomi on the Phelan ranch was the last home still used by its original Lake Miwok members. Oleyomi sat on the top and slope of a small rocky ridge on the south side of Putah Creek, at 38°-46'-47"-122°-31,-52". In 1957 Lake County Historian Henry K. Mauldin visited the area. He reported that many house sites clearly still could be seen, though part of the area had been trampled at one time by the heavy use of a corral surrounding it; there were mortar holes in rocks, and pestles were strewn about. A sweat house of tule and willow limbs, still used in the early 1900's, had stood at 38°-46,-42"-122°-31,-37". Approxiately 75 people still lived in the village prior to 1912. These people worked periodically on the Langtry property and other neighboring ranches.